In studying the highest levels of leadership, impact, and influence, several common aspects of effective communication become clear. The 10th anniversary of Ronald Reagan’s passing was Thursday, June 5, but even 10 years later and 25 years after his presidency, he is still known as the “Great Communicator.” He masterfully demonstrated effective communication throughout his presidency, a perfect and historical example being his speech at the Brandenburg Gate, when he implored Gorbachev to “tear down this wall!”. You can become a “Great Communicator” by carefully planning and creating your own messaging. Powerful communication skills are critical to positively affect the overall direction and impact of your vision and its fulfillment. Time and time again, Ronald Reagan not only spoke words with resonant meaning and impact but prompted action from the American people and the world. Whether it’s a keynote speech or a casual conversation with a family member, the true meaning and value of effective communication can be realized through focusing on the listener and tailoring your message accordingly, rather than prioritizing the words you want to say or the points you want to make. If you want to really improve the way you communicate and the impact your messages have on others, regularly evaluate what you say, how you say it, and how your words are being heard by others. If you truly want to communicate like the ‘Great Communicator,’ you need to challenge yourself to embrace communication excellence. Realize the significance, power, and the importance of clear, concise communication and the effect it can have on others and on the fulfillment — or the failure — of your vision. Have substance — something meaningful and important to say. There are many leaders today who talk more and more and yet say less and less. Know what you want to say before you start talking. Plan your communication with great intention. Communicate with honesty and authenticity — with sincerity. The more sincere your message is, the more impact it will have on others. As such, you need to choose your vision carefully and make sure it is one that you wholeheartedly embrace and can communicate genuinely. Believe in your vision and in your message. You need to have more enthusiasm for your vision than you expect others to have. Your passion and energy, or lack thereof, will be evident to your listeners. Tell your listeners what you are going to tell them, then tell it to them, then tell them what you told them. Make sure they leave knowing exactly what you want them to know and remember. 6. Say it again and again. Constantly refer to your vision. Have a consistency in your message every time you communicate. Make it clear to others what you stand for, what you believe in, and what your vision is. Repeat it. Retell it. Restate it. Repeat it. Personify your vision and symbolize it. 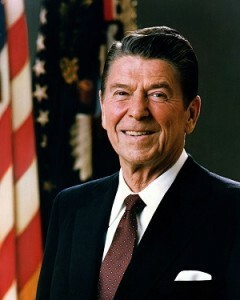 When you think of Ronald Reagan, you think of freedom. Make sure those around you know exactly what your vision is — and then personify it with consistency. Be aware of your stance: 55 percent of face-to-face communication comes from body language, 38 percent comes from tone of voice, and only 7 percent of communication actually comes from the words used. Your nonverbal cues speak much more loudly than your words, so learn to control and manage your body language and facial expressions, making sure they match your spoken message. Even though you may be articulating your vision over and over again, it will be more meaningful and memorable if the message is customized for those hearing it—specialize. You should talk to people, not over their heads or beneath them. Talk to them, specifically. Be prepared, study, be informed and well read, and have compelling, convicting arguments supporting your vision. You should know more about your subject matter, your industry, your plan, and your vision than anyone else. Research related topics and fields so that you have an expansive base of knowledge. Gather relevant facts and information and develop creative ways to share them. There are many effective methods of speaking, so find your unique style. Infuse your personality, your background, and your vocabulary into a personal cadence and rhythm of speaking that uniquely suits you. Practice articulating your vision. Ask for candid feedback and continue to hone your most effective style. Use small, short words that everyone can understand and remember. A simple message clearly articulated is much more effective than one that seeks to impress others with your knowledge but is not able to transfer any of that knowledge to others. Invite commitment and support. When you communicate, it should be clear what is being asked. Articulate your vision and outline the role you want others to play in fulfilling it. Do not assume they know what you are asking of them. You have to tell them—and then persuasively invite their support and their best efforts. Combine your content with original stories and personal examples that are meaningful to you and relevant to your vision. Stories can create far greater impact than just a conveyance of facts, ideas, or opinions. Chosen carefully, stories can affect others in powerful ways. Nothing is more effective in engaging others than a genuine smile when appropriate. It brings a transparency to your message and conveys a warmth and kindness that has the potential to disarm even the harshest critic. Open the lines of communication by smiling — it is contagious! Although there is no magic formula for becoming the Great Communicator, in your own way you can formulate, articulate, and communicate your vision with greater success, effectiveness, and confidence. As we see from Reagan, making memorable remarks is one thing, but those who are able to spur others to action, invite active participation, or cause a positive change in thinking or behavior truly understand the value and importance of communication. Words without action are without impact. Whether you are communicating a vision to your company or speaking to your family, my challenge to you is to incorporate the example of Ronald Reagan to achieve greater impact. Choose your words carefully to not only inspire action, but to create a positive environment in which you can change your world and the world of those around you. 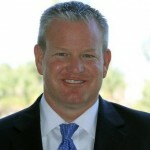 Dan Quiggle, author of “Lead Like Reagan: Strategies to Motivate, Communicate, and Inspire“, is the founder of The Quiggle Group, president and CEO of America’s Choice Title Company, and dean of faculty for the Leadership Institute in Washington, D.C. He began his professional career in the office of Ronald Reagan and learned leadership directly from the “Great Communicator” himself.